Even though the best way to make sure a text contains no grammatical mistakes is for a human to review it, a grammar checker is still valuable when no one has the time to proofread your work. 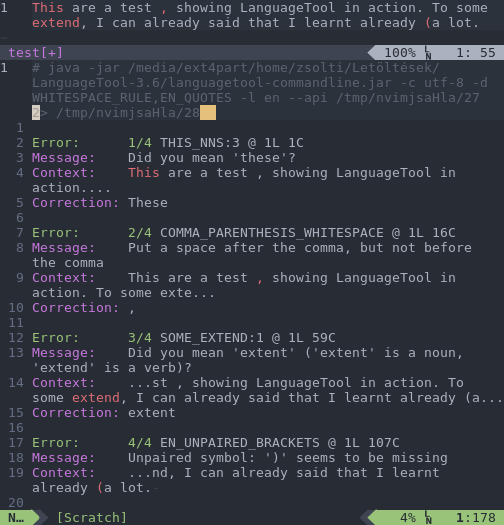 The plugins vim-languagetool and vim-grammarous provide integration with LanguageTool, which checks for errors not covered by Vim’s spell checker. It currently supports 31 languages. If you’re interested in a more lightweight solution (for English only), vim-wordy is a good choice. 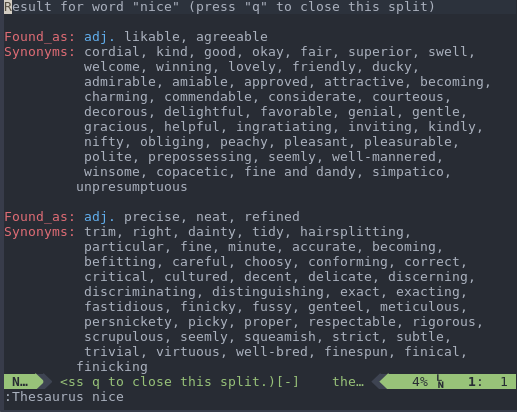 This plugin doesn’t depend on anything other than Vim, and it looks for mistakes in the current file based on weak wording, jargon, weasel phrases, and so on. On a typical keyboard, only straight quotation marks can be found (the characters ‘ and “), and many decide this based on their own style guide. However, if you’d like to follow typography rules, use curly quotation marks and apostrophes. Similarly, use en dashes and em dashes instead of single hyphens (-), and three dots instead of an ellipsis. Since I’m the type of person who generally pays attention to these rules, I have both UniCycle and vim-textobj-quote installed. When active, UniCycle turns all straight quotation marks into curly ones, three dots into ellipsis, and two or three hyphens into en dashes and em dashes, respectively. In addition to doing the same with quotation marks, vim-textobj-quote also provides navigation between opening and closing quotation marks, surrounding words with quotes, and so on. As claimed by Cal Newport in his book “Deep Work,” the more distractions we encounter during our work, the less productive we become. Coming from my own experience, I can confirm this to be true. Fortunately, you can easily reduce (and restore) the editor’s potentially distracting visual elements whenever you’d like. Having read the article on the blog titled, “The Darnedest Thing,” I’ve come across Goyo and LimeLight. Goyo disables or hides everything except the file content and the status bar, and centers the text using borderless splits (or, using Vim terminology, “windows”). The status bar is also stripped of everything but the most important parts, such as showing whether you are in insert or visual mode, messages of successful saving, etc. 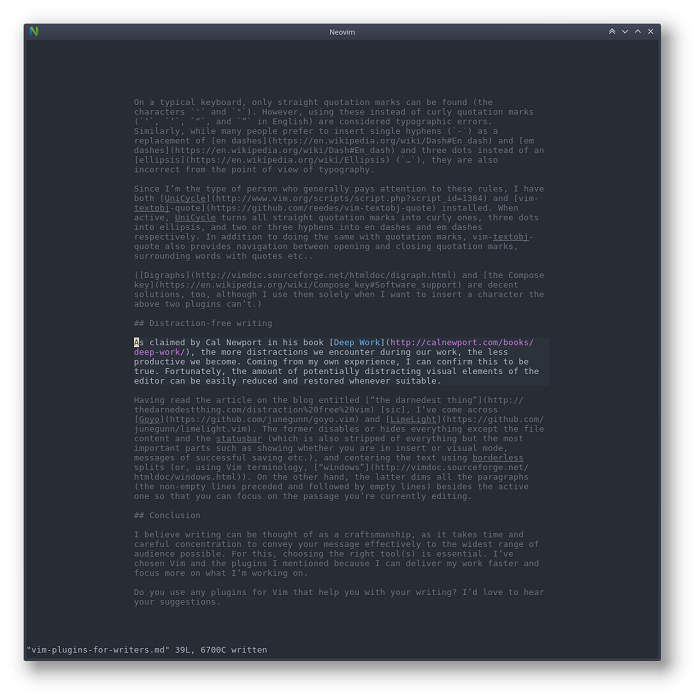 On the other hand, LimeLight dims all the paragraphs (specifically, the non-empty lines preceded and followed by empty lines) besides the active one, so that you can focus on the passage you’re currently editing. I believe writing can be thought of as craftsmanship, because it takes time and careful concentration to convey your message effectively to the widest range of your audience as possible. For this, choosing the right tools is essential. I’ve chosen Vim and the plugins I’ve mentioned because I can focus on my work and deliver it faster. Do you use any plugins for Vim that help you with your writing? I’d love to hear your suggestions.